The modern driveway is not a utility, it is a canvas! 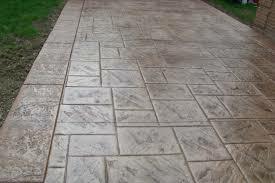 Modern decorative driveways are less paver mosaics, rather more free flowing, natural smooth-lined designs. 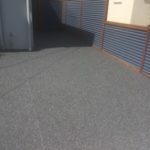 The new swirl driveway is innovative and compelling because it uniquely makes use of modern materials (polyurethane bound stone) to create previously unseen, seamless curves and lines. These free flowing swirls enhance the ‘natural’ appeal, where stone and water meet. 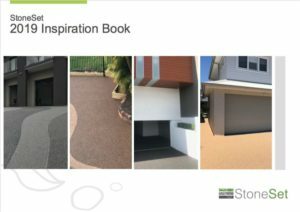 During 2018, StoneSet saw a significant number of driveways being re-imagined by progressive homeowners. 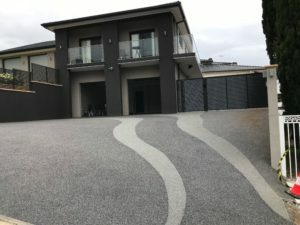 With the typical driveway occupying up to 30% of the visual frontage of your home, these owners recognised the opportunity to add unique style to their property. And why not? With their size and location at the front of a property, a driveway’s appearance can significantly impact the value of a new home. In this way driveway’s are often the most under-utilised design opportunity for most homes. Their significance is only recognised once the work has been done, our before and after gallery does a great job of making this point visually. 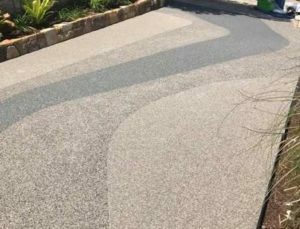 We had found Sydney’s North West has been leading this innovative new paving trend for Two-tone driveways. Most of the Hills Shire district, particularly suburbs like Kellyville, Castle Hill and The Ponds – shown left to right below. 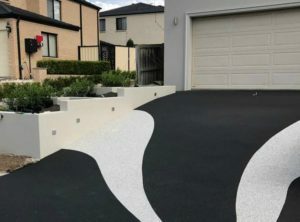 A google search for ‘decorative driveways’ typically yields a range of driveway patterns and borders. 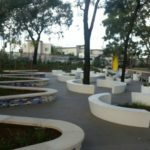 Due to the limitations of the materials used to create these surfaces, their appearance is typically square edged and blocky. 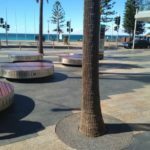 Pavers – decorative patterns are limited to an older style of rigid, straight lines and blocks. Occasionally specialty shaped pavers (triangular and hexagonal) can be used to create mosaic style patterns, yet the appearance is still somewhat blocky and sourcing/laying these add significantly to cost. 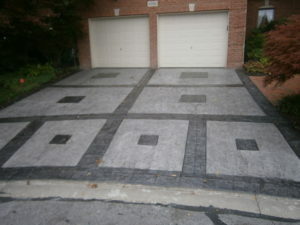 Stamped concrete – again is typically limited to a block like paving pattern of different colours. A mould Is shaped to emulate a natural stone or timber appearance. 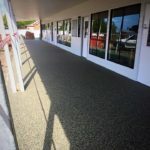 Whilst relatively cost effective, again a mould shape is re-used over and over, necessitating a paved style appearance. The more granular size of 6mm natural stone means StoneSet can create very fine details and perfectly smooth decorative swirls. For the below most recent application, the design was straight forward. 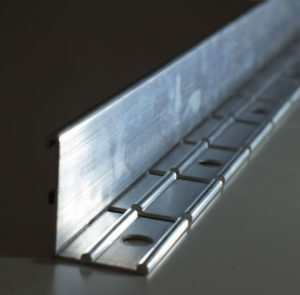 StoneSet managed the template of the pattern using a combination of link-edge and aluminium angles. 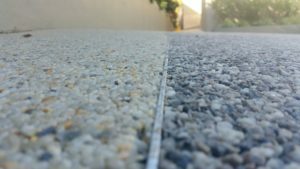 A simple application of aluminium angle (shown below) which is normally used as the form edging for the side of driveways, can be used to divide colours of stone on the surface of the driveway, creating a ‘two-tone’ effect. 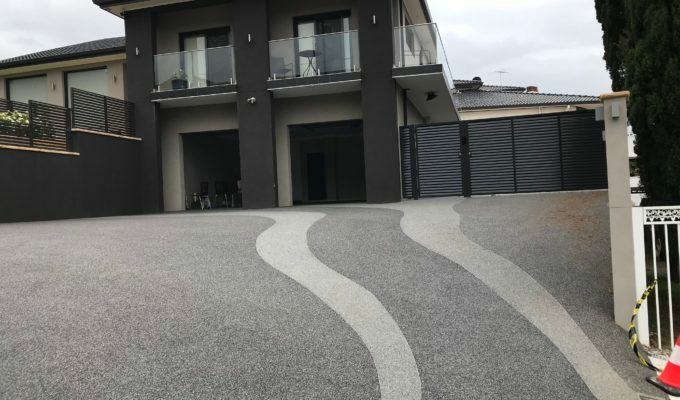 This thin aluminium divider is typically not visible leaving a seamless, natural multi colour, smoothed swirl appearance that gives you a more modern look to your driveway. The modern driveway is also a display of sound architectural form and function. Natural stone withstands UV exposure, whilst allowing free passage of water (porosity). 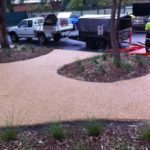 High grade resin binds the stone below the surface, un-affected by UV wear or puddles causing erosion. We understand that typically the costs of purchasing a new home can add up well before the home is finished. Particularly for house and land packages, where costs (and results) are better controlled by lump sum style contracts. Thats why we try to keep the costs reasonable for creating a natural stone driveway. 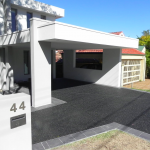 If you are looking at a driveway and perhaps rear courtyard we would estimate – $110/sqm (approx. 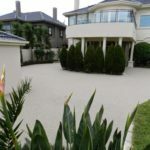 at 80+sqm) even including the cost to create a pattern across the driveway. Don’t settle for plain concrete! If you have purchased a new home off the plan, or have had a plain concrete driveway packaged up with your new home. An off the plan driveway can leave your brand-new home looking plain, stark and unfinished. 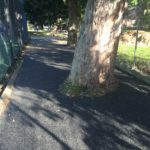 Thankfully there are options for resurfacing new concrete driveways. 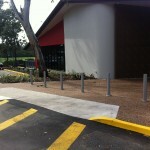 The typical driveway can occupy up to 30% of the visual frontage of your home. 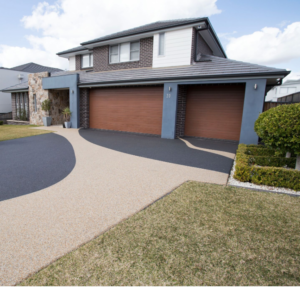 With this significant size it’s fair to say the quality of a driveway can greatly affect the appearance and value of your home. Most recently in Bossley Park StoneSet completed this modestly two toned driveway, a very classy modern touch. The two cascading flowing lines was in perfect fitting with a porous driveway application!